DALLAS, Aug. 1, 2018 /PRNewswire/ -- Twenty-two percent (22%) of Medicare Advantage plan members with chronic conditions responded they were familiar with the Star ratings system used by CMS. Of those, 51 percent used the grading system to help them choose a plan. Most of the remaining 78 percent who were unfamiliar with Star ratings said they would use them once they were informed, with 75 percent saying they would use Stars to help choose a plan in the future. The results are from a HealthMine survey of 781 Medicare Advantage plan members fielded in June/July 2018. 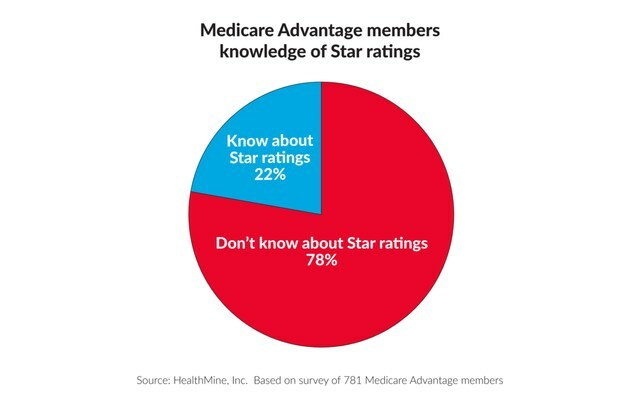 78% of Medicare Advantage members do not know about Star ratings. 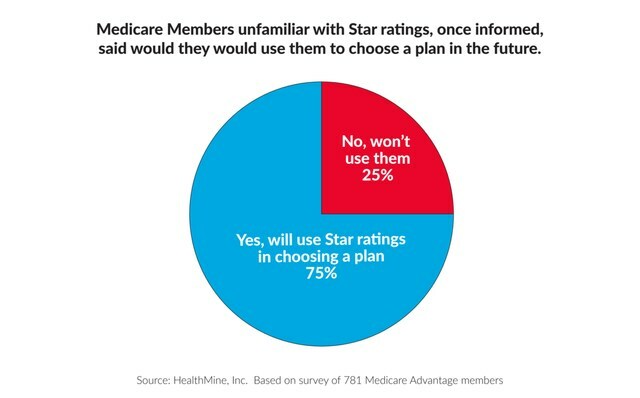 The 78 percent of Medicare members who did not know about Star ratings, once informed, 3/4 said would they would use them to choose a plan in the future. Despite most Medicare Advantage plan members unfamiliar with Stars, most are choosing plans with high ratings. According to the Centers for Medicare & Medicaid Services (CMS), in 2014, 52 percent of Medicare Advantage enrollees were in the highest rated plans with four or more stars; in 2017 that rate increased to 68 percent. A PwC analysis of the The 2017 Annual Report of the Boards of Trustees of the Federal Hospital Insurance and Federal Supplementary Medical Insurance Trust Funds, reveals that "Medicare Advantage is projected to cover nearly 21 million people in 2018, a 5 percent increase over 2017." According to Bryce Williams, CEO of HealthMine, "Awareness of Star ratings and their importance in plan selection will only increase. Plus, with ten thousand new Medicare eligible persons per day who are technologically proficient, leading plans are doubling down in strategic investments to enhance the customer experience. They are rolling out easy-to-use digital tools to communicate with members, and the new generation of Medicare Advantage beneficiaries have a greater propensity to use them. Assuring that the digital data is captured and used to meet Star ratings measures is critical for Medicare Advantage plans." According to the survey respondents, 77 percent of Medicare Advantage members use a smart device. Do you know what Star ratings are for Medicare plans? Were Star ratings a consideration in choosing a Medicare plan? (respondents below are the 22% who knew what Star ratings were). In knowing what Star ratings are, would you use the rating system to help choose a plan in the future? (respondents below are the 78% who did not know what Star ratings were).